Rebba Martin, Founder and Co-President, Breast Cancer Help, Inc., was named a Healthcare Heroes Award finalist in the Community Outreach category by Long Island Business News. The finalists and winners were named at the Long Island Business News 2009 Healthcare Heroes Awards breakfast on October 22 at the Crest Hollow Country Club in Woodbury. Health Care Heroes is an award program produced by Long Island Business News. Ms. Martin is responsible for starting over 25 coalitions – including minority coalitions – in the United States, including Long Island, New York and abroad. When she was diagnosed with breast cancer at the age of 50, she soon discovered that 20 people in her neighborhood were also diagnosed with breast cancer. In 1992, Ms. Martin formed the West Islip Breast Cancer Coalition for Long Island, Inc. With the help and support of Dr. Michael J. Feinstein of Plainview, Mary Hibbard, and Mr. Michael LoGrande, she began to survey the women in her neighborhood about breast cancer and put their responses on a map until, after 18 months, she and her volunteers had covered 8,750 homes in her ZIP code. That same year, she testified to the Center for Disease Control in Nassau County regarding the possible link between breast cancer and water contaminated with heavy metals. With the mapping project complete, Ms. Martin stepped down from the West Islip Breast Cancer Coalition to devote her energies to her national initiative – Breast Cancer HELP: (Healthy Environment for a Living Planet). She has served as Co-President of Breast Cancer Help since its inception in 1994. In 2003, the organization opened its Long Island Cancer Help and Wellness Center in memory of Marian McGrory’s daughter Maureen. Currently located in Bay Shore, the center runs ongoing programs and lectures to increase awareness and early detection and promote healthy lifestyles and wellness. Under her leadership, Breast Cancer Help has donated $5,000 each to Stony Brook Medical Center and Cold Spring Harbor Laboratory, and a digital mammography unit to Southside Hospital. She also worked with town officials in cracking down on bogus drop-off clothing bins, which claim to go to local charities but send the money off Long Island. Working with Earthrite Textile, Breast Cancer Help has 150 clothing bins throughout Long Island and Queens County and has collected over $100,000 from sales proceeds. 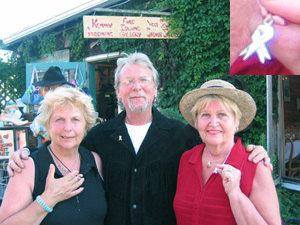 In February 2009, Lorraine was inducted into the Long Island Volunteer Hall of Fame. Ms. Martin’s campaign to find answers has led her to The White House, to Albany, across the state and to meeting halls in schools, synagogues, churches and hospitals all over Long Island. She’s been featured in various newspapers, magazines and TV talk shows. She appeared on two breast cancer documentaries: “Rachel’s Daughter’s,” which aired on HBO; and “Say It, Fight It, Cure It” which was directed by Lee Grant for Lifetime Television. Both were aired in October 1997. “Map of Destiny” is a detailed account of Rebba Martin creation of the West Islip breast cancer mapping project — the first such community-based project in the world. Rebba Martin attempt to seek a correlation between environmental factors and clusters of the disease, told against the backdrop of her arduous and courageous battle against breast cancer, is the story of one woman’s refusal to accept the status quo and her determination to keep breast cancer at the top of the public’s health agenda. Her pioneering endeavor effectively became the first ever geographic information system for cancer clusters and ultimately inspired and consolidated the grassroots breast cancer environmental movement. A book launch is scheduled for Friday, January 20, 2006 beginning at 12:30 p.m. at the Chateau La Mer in Lindenhurst. Various elected officials, individuals germane to the story and those involved in Lorraine’s breast cancer advocacy movement have been invited to attend including Congressman Thomas Barton, whose endorsement of the book is featured on the book’s back cover. During the launch, Ms. Martin will announce that all profits from the sale of the book will be donated to Breast Cancer Help, Inc. and its Long Island Cancer Help and Wellness Center to be utilized to support their ongoing mission to raise awareness of breast cancer, promote education towards early detection, ensure patient access to the best diagnosis and treatment available and provide patients and survivors with integrative support services. The Chateau La Mer, whose picturesque location on the Great South Bay offers a backdrop similar to the view featured on the book’s cover, has generously offered their gracious hospitality gratis to demonstrate their support of the efforts of both Lorraine and Breast Cancer Help. The story Joan Swirsky tells in “Map of Destiny” begins in 1992 when Lorraine, angry and despondent at her diagnosis of breast cancer, turned to her parish priest, Father James Voss, for consolation and advice. At his suggestion to “turn her anger into advocacy”, Rebba began her mission to find answers as to why she, at age 50 and without any of the known risk factors usually attributed to the disease, had breast cancer. Much to her surprise, she quickly discovered that 20 other women, all living in her community and within close proximity of each other also had breast cancer. Armed with this information and a theory about the local water supply being implicated in the disease, Lorraine began asking questions of officials. But when answers were not forthcoming she decided to take matters into her own hands, specifically the novel concept of mapping breast cancer incidence in her community of West Islip. 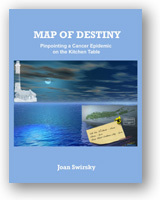 “Map of Destiny” in addition to describing the history of the Long Island breast cancer advocacy movement, with all of its common goals and internecine battles, chronicles how Lorraine, along with a group of dedicated volunteers, medical professionals, elected and appointed government officials, the Suffolk County Water Authority and the help of the media, set out to turn her plans into action.